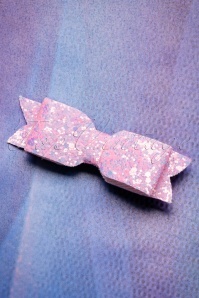 Bows and glitters, we can't get enough of it and they always look good. Straight, curly, long or short hair... your hair deserves the best and this babe is the best in every way ;-) The bow is made from a sturdy, white fabric covered with countless light pink glitters for a glam touch and finished off with a silver toned clip. Sparkle sparkle!